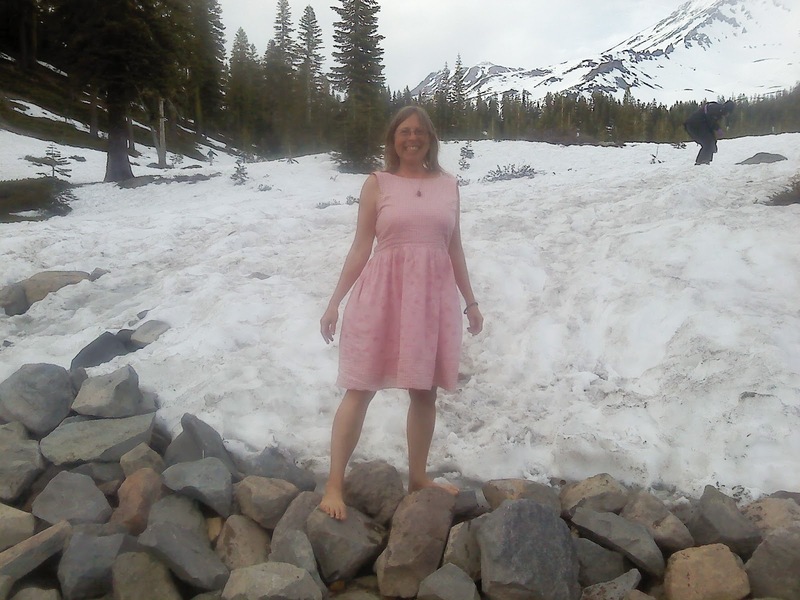 When I left my Mount Shasta motel wearing my favorite little pink sundress, I stood barefoot on the warm parking lot, drinking in the feel of the brilliant sun toasting my bare arms and legs before hopping in my car to drive up to the mysterious, majestic mountain that was beckoning me. I was astonished that my short drive up the mountain ended with the road blocked due to snow. It never occurred to me that I would see snow on the very last day of May in California. Unlike my recent, traumatic, surprise, mountain snow experience in the Rockies, (recounted in my last episode), this was only mildly daunting. I am, after all, a Midwestern girl! Although I was dressed inappropriately, my car was packed with all of my worldly goods. Given that things were packed so carefully that there was not room for a spare paperclip, it was not worth trying to dig out another outfit, but there were some shoes near the surface. So I set off on my hike through the rapidly melting, deep snow. Some of my steps plunged through the crunchy, upper crust which scraped my bare legs and my feet were soon squishing soggily in my cold, wet shoes. Despite these minor challenges, I was thrilled to be exploring this magical, magnificent mountain and tramped joyfully around until I was drenched with both snow and sweat. This was my first day in California and the last day of my nomadic season that had begun on the day my life changed forever. Although I wouldn't find the home promised to me by the obscure goddess I discovered in Nebraska until the fall, my new life in Marin was about to begin the next day. This day between seasons on Mount Shasta was the perfect setting for the day between seasons in my life. During times of transition; mystery, magic and opportunities to live into the magnificent and majestic capabilities we all possess are vibrantly alive. Although we usually feel ill-prepared and uncomfortable (or far worse), and we often founder with unsure footing, there is an adventure that awaits us. We don't need to travel to a mountain to find the beauty of this space between stories* in our lives. It is there every moment we say “YES” to what is. Whether that is squishy wet shoes or devastating losses. And that includes saying yes to our magnificence. WARNING: I am about to insert an overused inspirational quote on a scenic background that uses the “G” word. For those of you who are squeamish about that sort of thing, feel free to skip it. But if you can bring yourself to read these words, even though you've probably seen or heard them before, they are worth letting in. 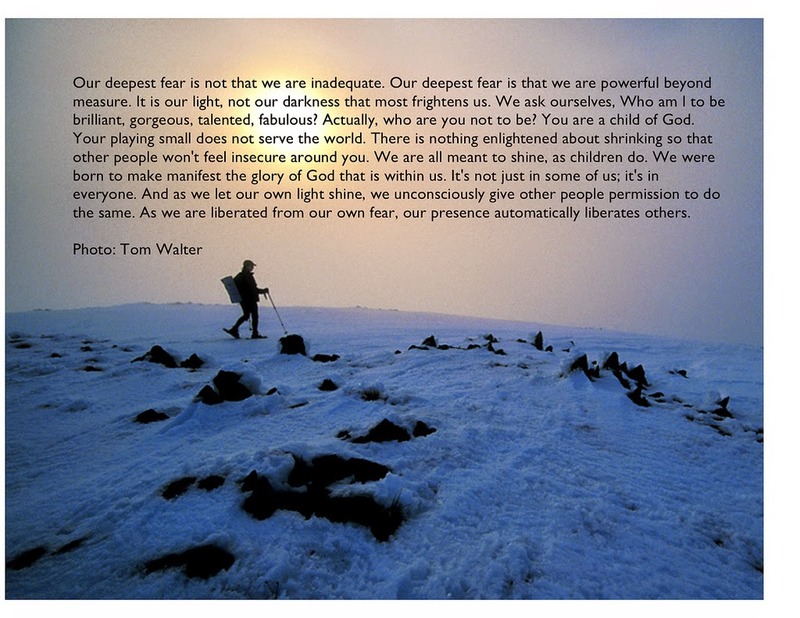 I do not pretend to be someone who shines above the masses on a mountaintop. I have WAY more than my share of quirks and flaws. I have spent huge portions of my life wallowing in the depths of depression and paralyzed by severe anxiety. I still stumble all the time and muck around in the muddy messes of my mistakes. We all do. It's part of being human (just a reminder that human has the same root word as humble, humiliation and humus which means dirt). But as flawed humans we also shine like gems whose flaws only serve to enhance our beauty. This too, is a kind of space between stories. The story of our lives in between our humiliations and our shining magnificence. Both are true, both are essential and both have their own beauty. So the next time you find yourself in a time of transition, whether you are at the moment when your world just imploded or you are standing trembling on the threshold of the mysterious new world that awaits you, I invite you to consider cultivating curiosity, courage and willingness to be present in whatever your experience is. If you can open to the possibility of magic and magnificence as you look up at your metaphorical mountain with all of its mystery, and seemingly insurmountable trails and trials, there will always be at least one step available to take. Just take that one. And the then next one. 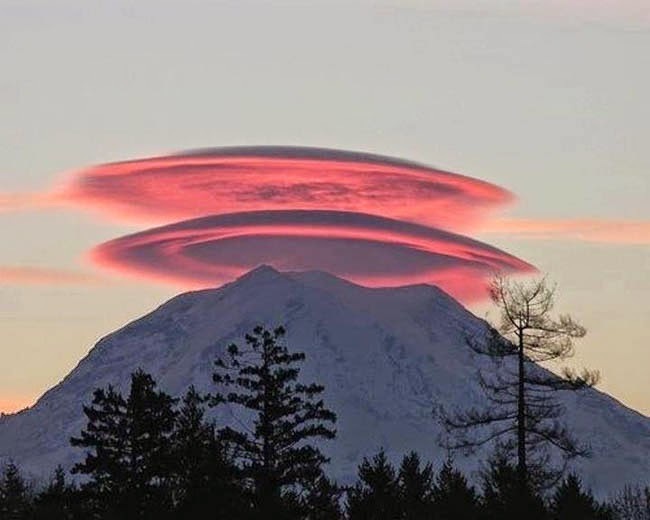 If you would like assistance in finding the magic of your mountain, I still have appointments available at the introductory price, but you will have to wait until Mid-May, when I return from my next mountain adventure to Mount Hood where I will celebrate Mother’s day with my mama. In between now and my Full Moon Newsletter, I wish you a New Moon sparkling with new possibilities, and lovely celebrations of Earth Day, Arbor Day and May Day. Hug trees! Smell flowers! Enjoy the delights of spring! * in addition to the space between stories in our personal lives that we periodically experience, there is a larger transition happening on our planet right now. I can't recommend this brilliant essay highly enough. If you feel bewildered or pessimistic about our era, this modern day philosopher has a unique perspective that is thoroughly grounded in depressing realities yet gives tremendous hope. I'm currently taking a class from Charles Eisenstein with the same title of this essay and it is knocking my socks (or squishy wet shoes!) off. I think the essay works on both the micro and macrocosmic levels to address the space between stories and is well worth a read.